Background and objectives Plasma fibroblast growth factor 23 (FGF23) concentrations increase early in the course of CKD in children. High FGF23 levels associate with progression of CKD in adults. Whether FGF23 predicts CKD progression in children is unknown. Design, setting, participants, & measurements We tested the hypothesis that high plasma FGF23 is an independent risk factor for CKD progression in 419 children, aged 1–16 years, enrolled in the Chronic Kidney Disease in Children (CKiD) cohort study. We measured plasma FGF23 concentrations at baseline and determined GFR annually using plasma disappearance of iohexol or the CKiD study estimating equation. We analyzed the association of baseline FGF23 with risk of progression to the composite end point, defined as start of dialysis or kidney transplantation or 50% decline from baseline GFR, adjusted for demographics, baseline GFR, proteinuria, other CKD-specific factors, and other mineral metabolites. Results At enrollment, median age was 11 years [interquartile range (IQR), 8–15], GFR was 44 ml/min per 1.73 m2 (IQR, 33–57), and FGF23 was 132 RU/ml (IQR, 88–200). During a median follow-up of 5.5 years (IQR, 3.5–6.6), 32.5% of children reached the progression end point. Higher FGF23 concentrations were independently associated with higher risk of the composite outcome (fully adjusted hazard ratio, 2.52 in the highest versus lowest FGF23 tertile; 95% confidence interval, 1.44 to 4.39, P=0.002; fully adjusted hazard ratio, 1.33 per doubling of FGF23; 95% confidence interval, 1.13 to 1.56, P=0.001). The time to progression was 40% shorter for participants in the highest compared with the lowest FGF23 tertile. In contrast, serum phosphorus, vitamin D metabolites, and parathyroid hormone did not consistently associate with progression in adjusted analyses. Conclusions High plasma FGF23 is an independent risk factor for CKD progression in children. Disordered mineral metabolism develops during the early stages of CKD, leading to skeletal abnormalities, cardiovascular disease, and impaired growth in children. Together, these complications comprise the clinical syndrome of CKD mineral and bone disorder. Critical to the pathogenesis of CKD mineral and bone disorder is an excess of fibroblast growth factor 23 (FGF23), a bone-derived circulating peptide. In children and adults with CKD, plasma FGF23 concentrations increase progressively as GFR declines (1–3). By suppressing the renal reabsorption of phosphate and the synthesis of 1,25-dihydroxyvitamin D [1,25(OH)2D] (4–6), excess FGF23 initiates the development of secondary hyperparathyroidism (2,7). Moreover, in adult patients with CKD, increased plasma FGF23 is associated with adverse outcomes, including premature death (8,9), left ventricular hypertrophy (10,11), cardiovascular disease events (12), kidney disease progression (13–15), and renal allograft dysfunction (16,17). Development of ESRD in children compromises life expectancy, yielding mortality rates for children on dialysis that are 30- to 150-fold higher than in healthy children of comparable age (18–21). Known risk factors for progression of childhood CKD include proteinuria, hypertension, glomerular disease, and low GFR (22). However, it is not known whether abnormalities in mineral metabolism, in particular excess circulating FGF23, are associated with CKD progression in children. Such an association is suggested by observations that, in children with a glomerular etiology of CKD, plasma FGF23 is higher (3) and the rate of CKD progression can be faster than in children with CKD of nonglomerular etiology. Identification of modifiable factors that affect CKD progression is critically important to the development and early implementation of therapeutic strategies that prevent or delay progression and its complications, including cardiovascular disease, the leading cause of death in CKD. In the present study, we tested the hypothesis that high plasma FGF23 is a risk factor for kidney disease progression, independent of baseline GFR and proteinuria, in children with predialysis CKD who were enrolled in the Chronic Kidney Disease in Children (CKiD) observational cohort study (23). The CKiD study is a prospective observational cohort study of children with CKD (23). Briefly, participants aged 1–16 years old with an eGFR between 30 and 90 ml/min per 1.73 m2 (2,24), were enrolled from 54 pediatric nephrology sites in the United States and Canada. Recipients of solid organ, bone marrow, or stem cell transplants were excluded; additional exclusion criteria are described in Furth et al. (23). The Institutional Review Board at each study site approved the study protocol, and informed consent was obtained from each participant and parent or guardian. The study is registered with Clinicaltrials.gov (registration no. : NCT00327860). Participants underwent annual study visits at which BP, GFR, and laboratory values were determined (23). GFR was directly measured by plasma disappearance of iohexol (25) at the enrollment visit, 1 year later, and every other year thereafter. When not directly measured, GFR was estimated using the CKiD study estimating equation that is based on serum creatinine and cystatin C concentrations (26). We use GFR to refer to either the iohexol measured value (when available) or the estimated value, for each individual. The CKiD study enrolled 586 participants from January, 2005 to July, 2009; for the present analysis, we included 419 participants for whom specimens were available for baseline measurement of FGF23, parathyroid hormone (PTH), and vitamin D metabolites at the first follow-up visit, which occurred within six months of enrollment. We found no differences in baseline characteristics between those participants included in the present study and those not included, with respect to age, gender, glomerular diagnosis, and GFR, respectively. Specimens for PTH, FGF23, and vitamin D metabolites were stored at −80°C until measurements were made. We measured plasma C-terminal FGF23 concentrations in duplicate by second generation ELISA (Immutopics Int., San Clemente, CA); inter- and intra-assay coefficients of variation were 11.5% and 5.7%, respectively. We defined 101 RU/ml as the upper limit of the normal range in healthy children (mean age, 12±4 years) (3). Serum concentrations of vitamin D metabolites were measured in duplicate by Heartland Assays (Ames, IA); 25-hydroxyvitamin D (25OHD) by chemiluminescence immunoassay (27,28), and 1,25(OH)2D by radioimmunoassay (29), as described (3). Serum creatinine, intact PTH, calcium, phosphorus, and urine protein and creatinine concentrations were determined in the CKiD Central Biochemistry Laboratory, University of Rochester, as described (3). Cystatin C was determined by nephelometry (Siemens Dade-Behring). Serum calcium concentrations were corrected for serum albumin concentrations using the following formula: corrected calcium=measured calcium+0.8×(4.0−serum albumin). Proteinuria was categorized based on the ratio of urine protein-to-creatinine concentration (Up/c), as <0.5 mg/mg, 0.5 to <2.0 mg/mg, or ≥2.0 mg/mg. Baseline systolic BP was categorized as a z-score relative to gender, age, and height-matched values (30). Hypertension was defined as a systolic or diastolic BP ≥95th percentile value for gender, age, and height (30). The primary diagnoses of CKD were categorized as either nonglomerular (obstruction/reflux, hypoplasia/dysplasia, cystic disease, pyelonephritis/interstitial nephritis, other) or glomerular (FSGS, familial nephritis, hemolytic uremic syndrome, other). Since serum phosphorus concentration varies with age in healthy children (31), we expressed phosphorus values for each participant as a z-score relative to age-matched values in 493 healthy individuals aged 1–20 years old (31). We summarized continuous variables as mean±SD or median and interquartile range (IQR) for skewed data, in the overall cohort and according to tertiles of FGF23: tertile 1, <100 RU/ml (within the normal range); tertile 2, 100–169 RU/ml; and tertile 3, ≥170 RU/ml. We expressed categorical variables as frequencies and proportions. We compared mean or median values of biochemical parameters between FGF23 tertiles using one-way ANOVA or the Kruskal–Wallis test, as appropriate. We used simple linear and multivariable regression analyses to examine associations between GFR and FGF23, 1,25(OH)2D, and other parameters of mineral metabolism. Values of FGF23 and PTH were natural log transformed to satisfy normality assumptions. Analyses were performed using STATA 12 (StataCorp., College Station, TX) and SAS 9.12 (SAS Institute Inc., Cary, NC) software. A P value of <0.05 was considered statistically significant. The primary outcome was progression of CKD, defined as a composite event of either initiation of dialysis or kidney transplantation or 50% reduction in GFR from the level at enrollment (baseline). Participants were censored for loss to follow-up or at the close of the observation period in August, 2013. The primary exposure variable was the tertile of plasma FGF23 concentration, the lowest tertile (normal range) serving as the reference category; we also analyzed risk of CKD progression according to continuous FGF23 concentrations, reported per doubling of FGF23. Secondary exposure variables were phosphorus z-score, 25OHD, and 1,25(OH)2D concentrations. We used multivariable Cox proportional hazards regression to examine the risk of progression to the composite event according to tertiles of baseline plasma FGF23, after verifying proportionality assumptions. In model 1, we adjusted for age, gender, and race. In model 2, we additionally adjusted for baseline GFR and proteinuria. In model 3, we additionally adjusted for systolic BP, medication use (angiotensin-converting enzyme inhibitors/angiotensin-receptor blockers, vitamin D analogs, and phosphate binders), and glomerular diagnosis of CKD. Model 3 is the primary model of interest in the present analysis. In model 4, we additionally adjusted for mineral metabolites (phosphorus z-score, tertiles of 25OHD and 1,25(OH)2D concentration). We performed similar risk analyses for each of the secondary exposures (phosphorus z-score, 25OHD, and 1,25(OH)2D concentrations); in model 4, we additionally adjusted for FGF23 and mineral metabolites other than the exposure variable. Serum PTH was measured in only 219 participants based on availability of suitable serum specimens; thus, we performed separate regression analyses that included PTH as a covariate, within that subset of participants. In separate complementary analyses, we examined the association between tertiles of baseline plasma FGF23 concentration and time to the composite event using parametric time-failure regression, assuming log normal distribution of failure times with adjustment for the covariates described above, as done previously in the CKiD study (22). With this approach, the interpretation for the association was expressed in terms of relative time to the composite event according to tertiles of FGF23 (e.g., a relative time of 0.6 would indicate a 40% shorter time to the event compared with the reference exposure). Characteristics of the 419 participants are summarized in Table 1. In the overall cohort, the median baseline GFR was 44 ml/min per 1.73 m2 (IQR, 33–57), and range was 16–109 ml/min per 1.73 m2. Three percent of participants had CKD stage 1, 20% had stage 2, 59% had stage 3, and 18% had stage 4. The median plasma FGF23 level was 132 RU/ml (IQR, 88–200), a value 2.3-times higher than that in healthy children of comparable age (31); FGF23 excess (>101 RU/ml) was observed in 65% of participants. Participants in the highest FGF23 tertile had significantly lower GFR and serum 1,25(OH)2D and albumin concentrations, higher serum phosphorus, phosphorus z-score, and PTH values, and more severe proteinuria, compared with those in the lowest FGF23 tertile (Table 1). Across the cohort, log plasma FGF23 concentrations varied inversely with GFR (R=−0.41; P<0.001), inversely with serum 1,25(OH)2D concentrations (R=−0.26; P<0.001), directly with phosphorus z-score (R=0.22; P<0.001), and directly with log of the Up/c (R=0.32; P<0.001); each of these associations remained significant after adjustment for GFR. Plasma FGF23 did not correlate with serum calcium or 25OHD concentrations. Over a median of 5.5 years (IQR, 3.5–6.6) of observation, 136 participants (32.5%) progressed to the composite end point; 121 participants underwent dialysis or received a kidney transplant, and 15 experienced a 50% decline in GFR from baseline values. Fifteen participants were lost to follow-up after their baseline visits. Seventy-four percent (n=308) of participants underwent four or more longitudinal measurements of GFR. Kaplan–Meier curves illustrate that higher tertiles of FGF23 were associated with higher probability of reaching the composite end point (Figure 1). In Cox proportional hazards models, the risk of progression was 2.3-fold and 5.0-fold higher in participants with FGF23 levels in the middle and highest tertiles, respectively, compared with those in the lowest FGF23 tertile (normal range) after adjustment for age, gender, and race (model 1, Figure 2, Table 2). With full multivariable adjustment for baseline GFR, proteinuria, BP, glomerular disease, and medication use, higher FGF23 concentrations remained significantly associated with progression, the risk being 2.5-fold higher in the highest versus the lowest FGF23 tertile (model 3, Figure 2, Table 2). The association between FGF23 and progression was also significant when plasma FGF23 was modeled as a continuous variable; each doubling of FGF23 was associated with a 33% higher risk of progression (model 3, Table 2). The associations were not attenuated when further adjusted for concentrations of other mineral metabolites (model 4). Higher tertiles of baseline plasma FGF23 concentration associate with higher cumulative incidence of progression to dialysis, transplant, or 50% decline in GFR from baseline. Log-rank test for trend, P<0.001. FGF23, fibroblast growth factor 23. Hazard ratio (and 95% confidence interval) for the composite end point of dialysis, transplant, or 50% decline in GFR from baseline, according to tertiles of baseline plasma FGF23 concentrations. Model 1: adjusted for gender, age, and race. Model 2: adjusted for covariates in model 1 plus GFR and Up/c. Model 3: adjusted for covariates in model 2 plus systolic BP z-score, glomerular diagnosis, angiotensin-converting enzyme inhibitors/angiotensin-receptor blockers, active vitamin D, and phosphate binder use. Tertile 1 (FGF23<100 RU/ml) is the reference group (R) in all models. Bars represent 95% confidence intervals. Asterisks indicate P<0.02 relative to the reference group. FGF23, fibroblast growth factor 23; Up/c, urine protein-to-creatinine concentration. The associations between FGF23 and progression remained significant and quantitatively unchanged when the analysis was restricted to the progression end points of onset of dialysis or transplantation alone: multivariable adjusted hazard ratio (HR), 2.36 in the highest versus lowest FGF23 tertile; 95% confidence interval, 1.31 to 4.27, P=0.004; HR, 1.29 per doubling of FGF23; 95% confidence interval, 1.09 to 1.53, P=0.003. In separate parametric time-to-failure regression models, higher tertiles of plasma FGF23 and high log FGF23 were independently associated with shorter time to progression to the composite end point. With multivariable adjustment, the time to progression was 40% shorter for participants in the highest compared with those in the lowest FGF23 tertile (model 3, Table 3). 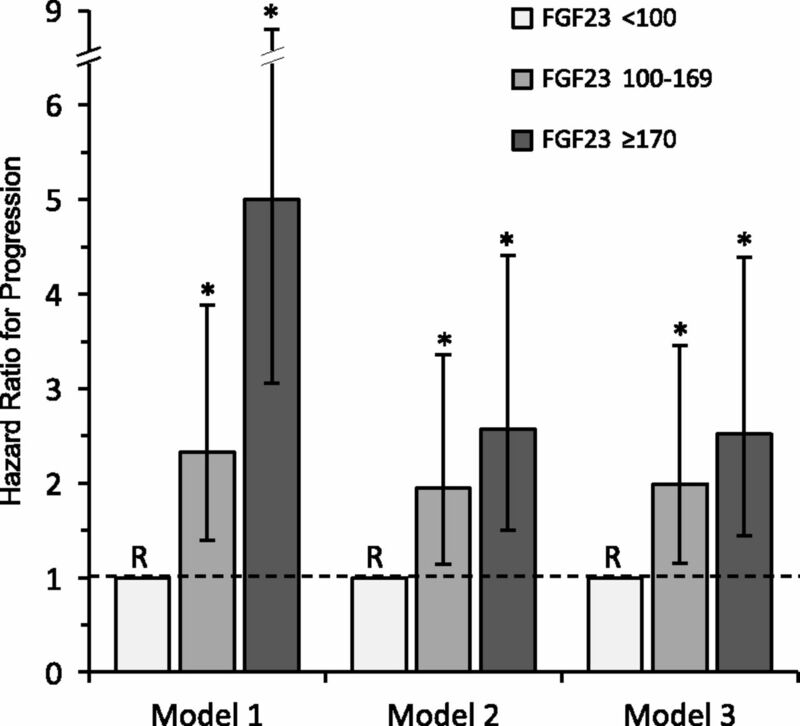 Each doubling of FGF23 was associated with an 18% shorter time to progression. The associations between FGF23 and outcomes were qualitatively unchanged when the analysis was restricted to the progression end points of onset of dialysis or transplantation only (data not shown). Serum 25OHD and phosphorus z-score were significantly associated with progression in minimally adjusted models, but the associations were heavily attenuated with full multivariable adjustment (Table 2). When modeled as a continuous variable, each 10 pg/ml lower serum 1,25(OH)2D was associated with a 32% higher risk of progression when adjusted for baseline GFR and proteinuria (model 2, P=0.004); however the association between 1,25(OH)2D and progression was attenuated and no longer significant in fully adjusted analyses (model 3, Table 2). Serum PTH, which was measured in a subgroup of 219 participants, was not associated with progression in any of the models and did not attenuate the significant association between FGF23 and progression (data not shown). In the largest longitudinal study of children with predialysis CKD to date, we observed that higher concentrations of plasma FGF23 were associated with a higher risk of progression to dialysis, renal transplant, or 50% decline in GFR. In participants with FGF23 values in the highest tertile (>1.7 times the upper limit of normal), the risk of progression was 2.5-fold higher than in those with FGF23 values in the normal range, and this association remained significant after adjustment for baseline GFR, severity of proteinuria, BP, and medication use including angiotensin-converting enzyme inhibitors/angiotensin-receptor blockers. Further, the association between higher FGF23 and outcomes remained significant when the analysis was limited to those reaching the stricter progression end point of dialysis or transplantation. 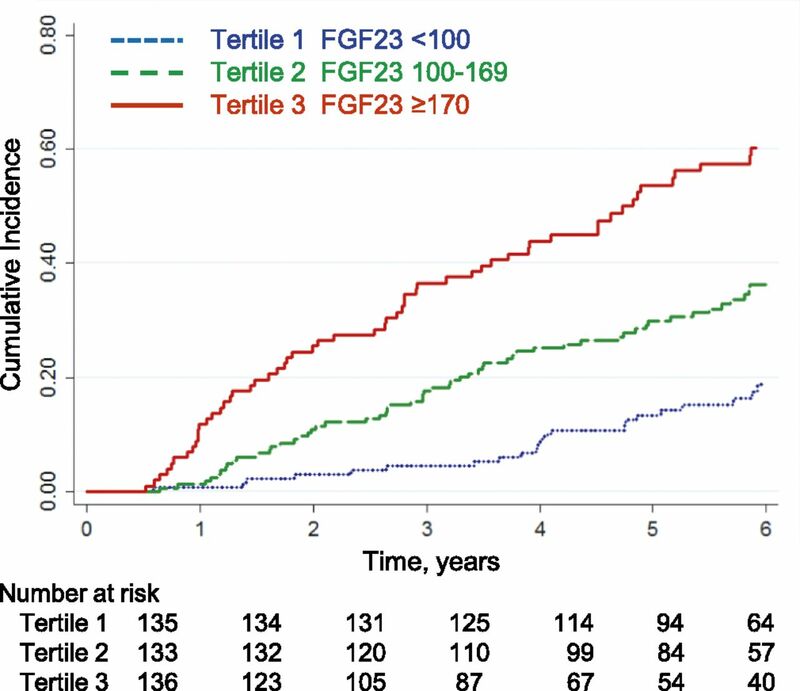 When analyzed as a continuous variable, each doubling of FGF23 was associated with a 33% higher risk of progression in fully adjusted analyses. In separate time-to-event analyses, progression to the composite end point was 40% faster in children with FGF23 values in the highest versus those in the lowest tertile. Thus, plasma FGF23 was strongly associated with progression before and after adjustment for confounders, showing a graded risk across the full range of values that was robust to several modeling strategies. Our finding that FGF23 is an independent risk factor for disease progression in children with CKD is consistent with studies of adults in which FGF23 was shown to independently associate with CKD progression in patients with diabetic and nondiabetic renal disease (13,32,33), IgA nephropathy (14), and hypertensive nephrosclerosis (15). The magnitude of the effect of FGF23 on CKD progression in the present study is very similar to that in studies of adults (14,15,17,32). Further, FGF23 independently associated with a higher risk of mortality (17) and allograft dysfunction (16,17) in renal transplant recipients, and the development of ESRD in the general population (34). In some but not all of those studies, PTH (13,15) was an additional risk factor for progression. However, we found no association between risk of progression and PTH, which was measured in approximately half of study participants. The effect of 25OHD status on CKD progression recently was examined. Scialla et al. found no association between quartiles of 25OHD and CKD progression in black participants with hypertensive nephrosclerosis (15). In a post hoc analysis of data from the Effect of Strict Blood Pressure Control and ACE Inhibition on the Progression of CRF in Pediatric Patients trial, Shroff et al. found that 25OHD was an independent predictor of progression in 167 children with CKD of nonglomerular origin (35). Although we observed that low levels of 25OHD associated with a higher risk of progression in minimally adjusted analyses, the association was heavily attenuated after further adjustment for GFR, proteinuria, and BP. There are some differences between the two studies: Shroff et al. studied fewer children and the prevalence of vitamin D deficiency was higher than in the present study. Also, higher systolic BP was significantly associated with progression in our analyses (data not shown) but not in those of Shroff et al. (35). They also found that FGF23 was associated with progression in adjusted analyses (HR, 1.03 per 10 RU/ml higher FGF23; 95% confidence interval 1.005 to 1.057). Higher baseline levels of proteinuria (22,36) and BP (22,36) have been associated with greater risk or faster rate of progression in children with glomerular and nonglomerular etiology of CKD. Children with glomerular diseases have higher levels of proteinuria and plasma FGF23 (3), both of which might contribute to more rapid progression than in those with nonglomerular etiology. In the present study, the association between baseline FGF23 and outcome remained significant even after adjustment for proteinuria and glomerular etiology; indeed, glomerular etiology did not significantly associate with progression in any of the models that adjusted for baseline GFR and proteinuria. A renoprotective effect of active vitamin D metabolites has been identified in some experimental (37,38) and clinical settings (39,40). However, we failed to observe an association between serum 1,25(OH)2D and progression after multivariable adjustment that included proteinuria, medication use, and systolic BP, the latter a predictor of CKD progression in children (22,36). We (22) and others (41) previously observed that hyperphosphatemia was a risk factor for CKD progression in children, using analyses that adjusted for GFR alone (22) and not for proteinuria (22,41). Indeed, we identified proteinuria as the strongest predictor for CKD progression in children (22). In the present multivariable analyses that included adjustment for proteinuria, serum phosphorus did not significantly associate with progression, suggesting residual confounding in prior studies of children (22,41). Some studies of adults with CKD report an association between serum phosphorus and progression (15,32,42,43), whereas others do not (13,33,44). The mechanisms underlying the association between plasma FGF23 concentration and CKD progression, cardiovascular events, and death are unknown. Experimental data favor a direct pathophysiologic role of FGF23 in cardiac toxicity, specifically ventricular hypertrophy, via an FGF receptor 4–dependent pathway (11,45,46). Alternatively, the association between FGF23 and CKD progression might not be direct but rather mediated or confounded by other factors. FGF23 can aggravate other parameters of mineral metabolism that could modulate progression, such as suppression of 1,25(OH)2D synthesis and worsening of hyperparathyroidism (1). The independent effect of FGF23 in our analyses that adjusted for vitamin D and other mineral metabolites argues against this potential mechanism. Our findings suggest that plasma FGF23 has the potential to be a clinically applicable therapeutic target, as it increases early in the course of GFR decline and is strongly associated with disordered phosphorus metabolism. Higher plasma FGF23 might identify patients with CKD who may benefit from various strategies to lower serum phosphorus concentration, even if values are in the nominally normal range. A major strength of the present study is the recruitment of a large cohort of children from multiple centers across North America whose cause of CKD is broadly representative of that in children. GFR was determined longitudinally by direct measurement in the majority of participants or using a highly accurate estimating equation in the remainder. Follow-up of participants extended for a median of 5.5 years, and associations between FGF23 and progression were robust to analysis using both proportional hazards regression and parametric time-to-event regression, the latter not requiring assumption of proportional hazards, and when using the strict progression end points of dialysis and transplantation. The study has several limitations. Our data do not demonstrate causation or reveal mechanisms that might mediate the association between FGF23 and progression. FGF23 was determined 3–6 months after baseline GFR was measured; however, GFR is predicted to decline by <1 ml/min per 1.73 m2 over this period (47). GFR determined by iohexol clearance might underestimate GFR as determined by inulin clearance (48,49). Such underestimation should not bias our results as we defined progression as dialysis, transplantation, or a within-person decrease of 50% in GFR rather than an absolute value of GFR. Further, the CKiD study estimating equation itself was derived from the plasma clearance of iohexol; thus, comparisons between measured and estimated GFR are unbiased. Although only measured in approximately half of participants, PTH did not associate with progression or attenuate the association between FGF23 and progression. Finally, we used a single baseline measurement of FGF23 to predict follow-up events; whether changes in FGF23 over time add incremental predictive value is unknown. In summary, we demonstrate that higher plasma FGF23 is an independent risk factor for CKD progression in children. Interventional studies are needed to determine whether therapeutic strategies that reduce or attenuate the increase in plasma FGF23 can prevent or delay the progressive course in children with CKD. A.A.P. has received honoraria from Sanofi US (Bridgewater, NJ) and Ultragenyx (Novato, CA). M.W. has served as a consultant or received honoraria from Amgen (Thousand Oaks, CA), Ardelyx (Fremont, CA), Diasorin (Saluggia, Italy), Keryx (Boston, MA), Lilly (Indianapolis, IN), Pfizer (New York, NY), and Ultragenyx. I.B.S. has received honoraria from Cytochroma (Miami, FL), AbbVie (Redwood City, CA), Amgen, and Sanofi. H.J. is named on a patent describing the FGF23 assay that was used for this study. S.L.F. has received honoraria from Johnson and Johnson (New Brunswick, NJ). B.A.W. has received honoraria from Amgen, Sanofi, and AbbVie. This study was supported by grants from the National Institute of Diabetes and Digestive and Kidney Diseases [NIDDK; R01-DK-084978 to A.A.P., PO1-DK- 11794 (subproject IV) to H.J. ], grants from AbbVie and Genzyme Corporation (to A.A.P. ), and the Pediatric Nephrology Innovative Research Fund (to A.A.P.). The CKiD study is funded by the NIDDK, Eunice Kenney Shriver National Institute of Child Health and Human Development, and National Heart, Lung and Blood Institute [UO1-DK- 66143, UO1-DK-66174, U01-DK-082194, and UO1-DK-66116 (Principal Investigators: S.L.F. and B.A.W. )].